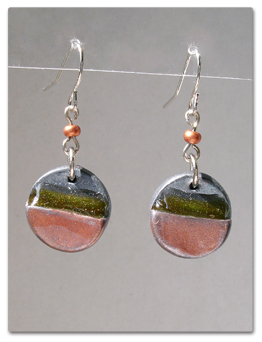 Here are a couple of new earrings I created which have a sort of ledge on the front where resin was applied. 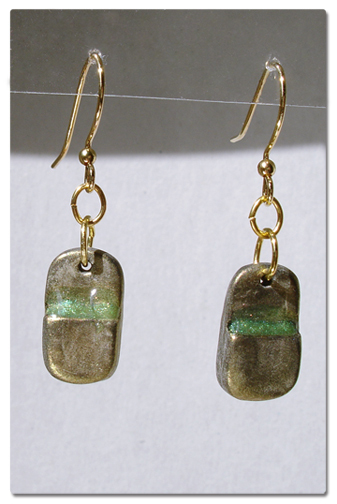 This first pair are tiny rounded rectangles with an antiqued gold effect on them. The resin filling the ledge on the front is mixed with a bit of green metallic powder to give it a bit of shimmer. The round pair above have a gunmetal grey metallic finish as the base with half circle antiqued copper metallic finish on top. The ledge on this pair is filled with resin tinted green with alcohol pigment. It’s a little hard to tell it’s green but the resin is extremely shiny, which catches the light really well. A single copper bead connects it all to the earring wire. I like the effect of the resin sitting on a ledge in the clay, so I’ll definitely be trying out other variations in the near future.